This tweet may be a miscalculation. Panamanians might actually be eager to find tickets for such an event. 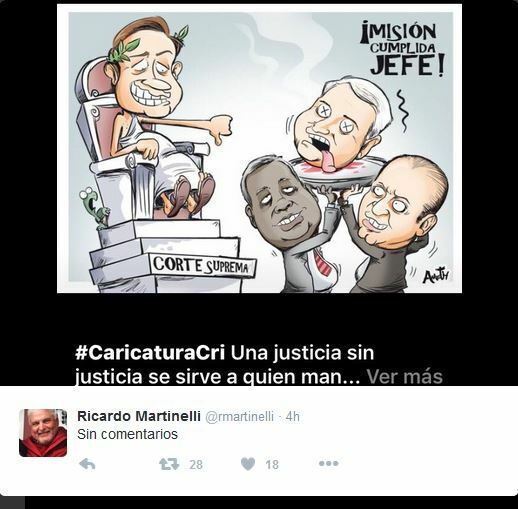 Taken from Ricardo Martinelli’s Twitter feed. On December 11, Ricardo Martinelli had a court date and sent his wife and eight lawyers instead. He was held in contempt, the court would not hear his lawyers that day, and the former president — who generally was less impressive to women voters all along — has surely taken a public relations beating among the relatively macho Panamanian male electorate. The 11th was a Friday and a request was made for a Monday hearing by a nine-member Supreme Court plenum about whether to issue a warrant for Martinelli’s arrest. After some missteps, that hearing was held on the afternoon of Monday, December 4. Meanwhile, on the 11th Martinelli’s lawyers filed a habeas corpus motion to head off an arrest warrant, and on the morning of the 14th they filed a motion seeking to disqualify five magistrates or suplentes — José Ayú Prado, Oydén Ortega Durán, Hernán de León, Abel Augusto Zamorano y Luis Mario Carrasco. The purported grounds for disqualification were that all of these jurists are in one way or another involved as judges or prosecutors in pending cases against the former president. But suplente Wilfrredo Sáez, given the task of writing the decision, cited Article 60 of the Code of Criminal Procedure. This provides that the judges or magistrates in charge of ordering or intervening in interim measures are not disqualified by that. The panel, consisting of suplentes Sáez, Gisela Agurto and Luis Carrasco, acting magistrates Abel Zamorano and Nelly Cedeño and regular magistrates Oydén Ortega, Hernán De León, Harley Mitchell and Luis Ramón Fábrega. José Ayú Prado was out of the countr. The issue decided was not close. The plenum took the unusual step of rejecting a motion on the day it was filed. Some of the private attorneys representing some of Martinelli’s victims talked about unheard-of but provided for in the law disciplinary measures against the former president’s lawyers for illegal dilatory tactics. The habeas corpus motion was not decided that day. Gisela Agurto was assigned to write that that decision and another plenary hearing was set for Wednesday, December 16. A court press release mentioned that in addition to that decision, a ruling might also be made on that day about acting prosecutor Harry Díaz’s motion to issue an arrest warrant for Martinelli. Díaz was a Martinelli appointee, as was his brother, Javier Díaz, who served as health minister in the Martinelli administration. Javier is facing a number of corruption charges having to do with accumulating inexplicable wealth — five condos and a private foundation — while in public office. So Martinelli sent out a tweet accusing Harry of being the true owner of these things and Javier of acting as a front for his brother. As in, the former president throwing one of his former subordinates who is in trouble and had not turned against him under the bus in order to get at the brother whose job is to sit in judgment. Harry Díaz issued a stinging rejoinder denying any wrongdoing, not defending his brother except to note that unlike Martinelli Javier stuck around to confront the charges against him, and insisting that he will neither be intimidated nor manipulated by the ex-president. The habeas corpus motion is unlikely to prosper. It’s based on a claim that the motion for an arrest warrant that Díaz made can only be made by a plenum of the court. But Article 492 of the Code of Criminal Procedure, an amendment to the code proposed by one Ricardo Martinelli and rubber stamped by a National Assembly that Martinelli controlled, specifically provides that in such cases it’s up to the magistrate acting as judge to make such motions. The former president’s lawyers now say that the former president’s own legislation is unconstitutional and can’t be used against him. They don’t coherently state why that would be the case.